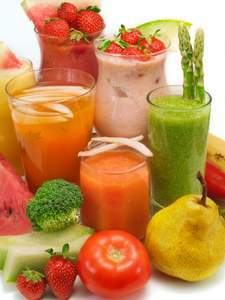 Here are simple instructions on how to make smoothies that are green, healthy and delicious. Make your own smoothie blend and know that it's fresh, without additives or preservatives. You can choose your own combinations and experiment with flavours. Green smoothies made at home are a convenient and available source of nutrients for health, energy and fighting disease. Green smoothies are about 40% greens, 60% ripe fruit. Place the greens and water into your blender and blend for 30 second or until well combined. Add fruit to your blender mix and blend for a further 30 seconds. Pour into a glass and drink straight away. Blend your greens and water before adding fruit so that the greens can become really well broken down. Fruit is usually softer and doesn't need quite as much blending. Blending the smaller volume of greens and water seems to be more effective in producing a smooth consistency, especially if you're using harder greens like kale, silverbeet or even parsley. If you're saving some smoothie for later, give it a quick mix with a spoon before you drink it to re-combine the water which sinks to the bottom. It's easiest to make smoothies in a blender, but if you don't have one you can try a food processor. The result isn't as smooth and a food processor is generally harder to clean than a blender, but if you're experimenting before investing in a blender a food processor will give you an insight into how a smoothie will taste. You'll just have to chew a few chunks and look forward to a smoother consistency once you invest in a blender.